20th-century (?) blue velvet in blue morocco case, incorrectly labeled: The Duc de Gueldres Prayerbook - circa 1446. Purchased by J. Pierpont Morgan (1837-1913) in 19084. Frémont (18th century); Charles Lormier collection (not traced in his sales, Paris, 1901-1907); purchased by J. Pierpont Morgan (1837-1913) from Pearson in 1908; J.P. Morgan (1867-1943). 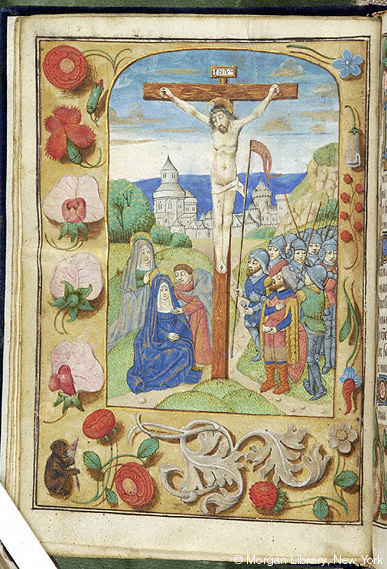 Ms. book of hours for the use of Rome (Hours of the Virgin); written and illuminated in Belgium, perhaps Tournai, in the 1480s.